Location: On the corner of Terrace Road and North Parade. 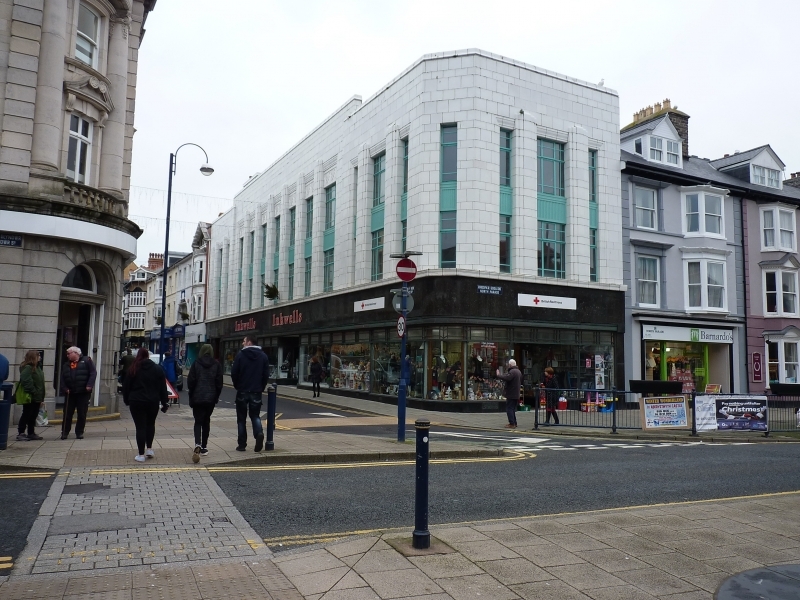 Dated 1938 and purpose-built as a Burton's tailors store in their characteristic Art Deco house style. Montague Maurice Burton (1885-1952) opened his first store in Chesterfield in 1904, and entered the bespoke tailoring business in 1912. By 1914, there were 12 shops, mainly in the north of England; by 1939 there were 595. At first the stores occupied existing buildings, but from 1923, new stores were built on freehold sites, and prominent town-centre corner sites (such as this one) were favoured. In about1932, the company established its own architectural department, which maintained the house style established by the architect Henry Wilson, who had been working for the company since 1923. In about 1937, Nathaniel Martin became chief architect, so this store is probably his work. Burton's stores are important as pioneering exponents of corporate architectural style, and as sponsoring Art Deco design. The building presents a long elevation to Terrace Road, an angled corner, and a shorter return elevation to North Parade. 3 storeys (with a fourth attic storey concealed behind the parapet). Long elevation to Terrace Road (3-7-3 bays) with 3 bay return. White faience facades. Shop-front curves around corner, and has entrance central in each elevation. Polished black granite, with stall risers (with cast vents inscribed' Montague Burton The Tailor of Taste') and deep fascia; large display windows with slender moulded iron rails; the doorways are recessed, with curved panes then angled-back windows. Continuous overlights to shop windows have margin lights punctuated by chevrons - a characteristic Art Deco motif. Main entrance on Terrace Road has terrazzo threshold and glazed door with elongated octagonal panel. At the left of this elevation is the separate entrance to the upper floors (which typically of Burton's stores, were given independent access for use as leased-out offices). This has paired wooden doors, with similar solid panels, flanked by windows behind decorative iron-work grills. Foundation stones flank this entrance, inscribed with the date, and the names of Raymond Montague Burton and Arnold James Burton. There is another foundation stone at the end of the North Parade elevation, with the name of Austin Stephen Burton. The upper storeys have a strong rhythmic design, which unifies both elevations via an angled corner. On the Terrace Road elevation, they are articulated as 3-7-3 bays, the central section advanced and stepped up. The bays are defined by continuous pilasters, whose clustered form is reminiscent of the 'fins' of other Art Deco designs. Recessed between these, the storeys are separated by fluted iron-work panels. Original 'Crittal' type windows: in the outer bays a wide central window is flanked by narrow side lights; wide windows throughout in the 7 central bays. These have tripartite glazing, with transoms and margin lights to top and bottom, as well as the sides of the outer lights. The narrower side lights also have transoms and margin lights to top and bottom. Central section is also emphasised by a faience frieze of interlocking curves (another characteristic Art Deco motif) above each window. The North Parade elevation repeats the 3-bay treatment. Ground floor retail space (now subdivided), with independent access to office accommodation on the upper floors; these include a narrow attic storey, completely hidden behind the high parapets of the facades. A fine example of the Burton Art Deco house style on a prominent town-centre site. Burton's buildings made an important contribution to the development of commercial architecture in the inter-war period, and were significant exponents of the Art Deco style. This example is exceptionally intact. Near the corner with Terrace road, No 20 stepped up. Entered on the rounded corner with North Parade. Entered on the splayed corner with Baker Street.